Z at the sink having a grand time! 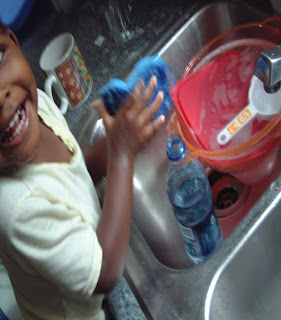 My daughter spent almost an hour standing on a chair at the kitchen sink, "washing dishes" She was so happy just pouring the water out from different cups. I threw in a water bottle and a sieve. I put in clean plastic bowls. She was happy, singing and content for a long time. While she did that I stayed close and cooked. I cleaned up too. She had a large bowl and pitcher that held the water. The chair is great but you do need to supervise them carefully. A step stool works good too. But the chair allowed her access to the faucet. I let her turn on the faucet and watch the water pour into the bowls. I spoke to her about saving water and not letting it just run. After telling her about conservation she followed me around the next few days telling me, "don't let the water run!" whenever I was doing dishes or brushing my teeth. I saw a friend of mine do this when my daughter went to her house. She put some rags or towels on the floor. She had some large bowls and cups with water. My daughter poured the water from cups into the bowl. She sat down and had a great time. Again, she had to be monitored as to avoid a flood but otherwise she was great. I think preparing the area with adequate rags and towels is most important and a large enough bowl. She had cups, small floating toys, spoons to mix. A good tip: save old yogurt containers, spice containers with the the big and little holes. These are great water play accessories too. Bath Time is great. Most kids like to be in the tub splashing and pretending swim. Once in a while let the kid play in the tub even if it's three in the afternoon. In the tub cups and bottles are great tub accessories. My daughter and I pretend that we are whales swimming in the ocean! Of course a little kids inflated pool is nice. Adults can sit in one of these too and cool down from the summer heat. Those spinning sprayers are great. Games can be made about jumping over or going under the spray. Letting them spray the hose and water the yard is so much fun. My daughter likes to fill a little watering can and go about the yard watering the different plants. Go to a real pool. There are pools at gyms, at the Y, at some parks. Try to get to a pool this summer, the kids will love you for it. Water parks are great. I'm not a big fan of amusement parks and long lines but there was a point in my life where I was and I loved it. That long slide straight into a cold pool has to be the best. I have lots of family and friends who have gone to water theme parks and they had complete blasts. A small pond or stream. Contemplate a puddle. Kids LOVE puddles. Maybe it is the feeling of another world. Or it's a nice pool of water to splash in. Go out in the rain. Bring umbrellas and take a walk! You are not made out of sugar though you are so sweet. You will not melt in the rain. I've seen a blind woman get on the bus with her toddler and seeing eye dog. A little rain can't keep you down or keep you stuck inside. Water! Bountiful. We are made mostly of water. All humans lived as merbabies growing within their moms before breathing air we breathed fluid. This is the shelf where my books will be! I finished a kids chapter book! I've had this idea for three years now. My daughter and I had been talking about this story and acting out the story! I've been querying like a mad woman....oh the world of publishing...so interesting and not at all intimate and cozy. more cold and despondent. anywhoo. so this agent said YES we want to read the whole book. uh uh I did not have a whole book. I had a bunch of ideas typed up, i had like four chapter done. I decided to finish the book. It took five days and hardly any sleep. my husband went out of town that week end. I kissed him bye and went back to work. I had both kids and household and somehow I pulled it off! I had to jump back three times and KISS myself that is how proud I am that I did it. I am now working on the second book. I am hoping this could be a series. It would be great to have more mulitcultural books out there. My daughter is an AVID reader and I would love if in the next few years my books get published. She is already reading my stuff and telling me what she thinks and giving ideas.